What a signing Rodriguez would be. A great chance for him to coming to England with the possibility of promoting to the Premier League. Last season the team was far from thinking in promotion. With this new additions, there should be a step forward. Do you think it's realistic to think in promotion with this squad? Don't know Rodrigues but he looks like a passing CDM, I think this fits to Lillo's ideas and therefore he would be a good signing. Some really good signings. I really think you might get promoted this season looking at the transfers alone. Two quality signings! 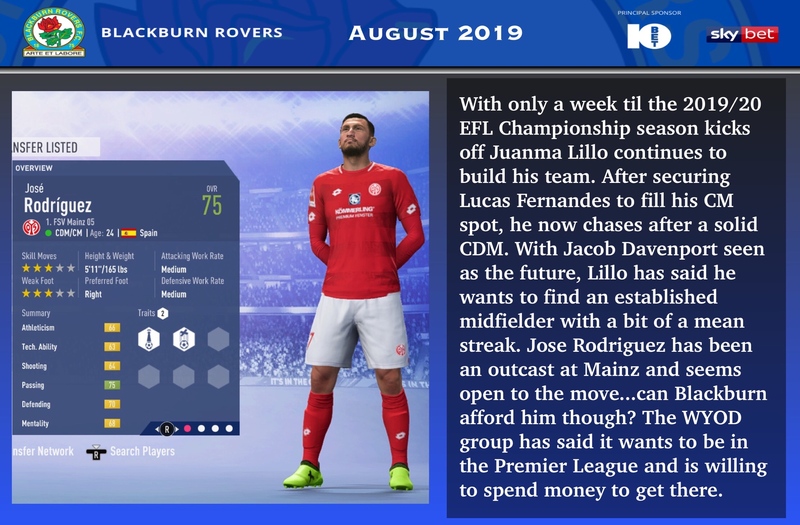 Is Lillo aiming for promotion this season? 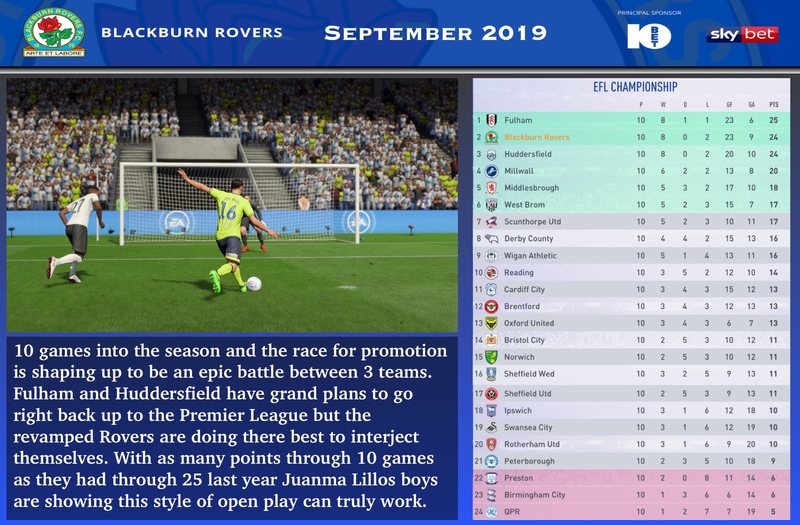 An incredible start to the new season as Blackburn Rovers flys to the top of the Championship standings winning 5 of there first 6. Juanma Lillos tactics look immense and he has totally transformed a team that looked midtable at best. The new midfield pairing of Rodriguez and Fernandes has been dominant and the only bit of bad news this month was the loss of Anthony McDonald for 2 months. All your games at home? Yeah we had to rotate heavily against Leeds and they were just to much for us. Good start to the season. As @Danimal5981 suggested, it'd be good to know if you play at home or away. Amazing start to the season top of the league! Unlucky losing to Leeds in the cup there too, they are a strong team and much better in quality than you so it happens. 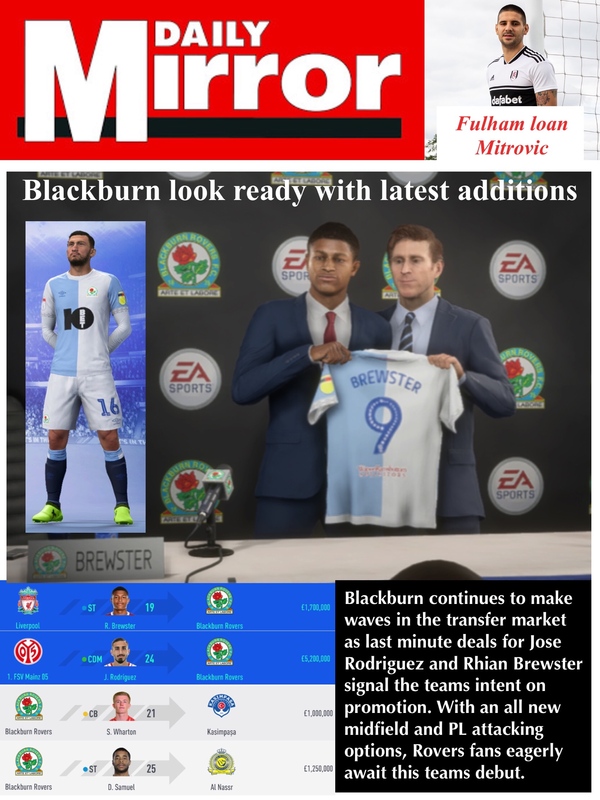 I really like the Brewster signing though, young English striker with a lot of potential, can he reach it at Blackburn?! Been an amazing start. Lillos tactics are very different then what I’m used to but the players have responded well. 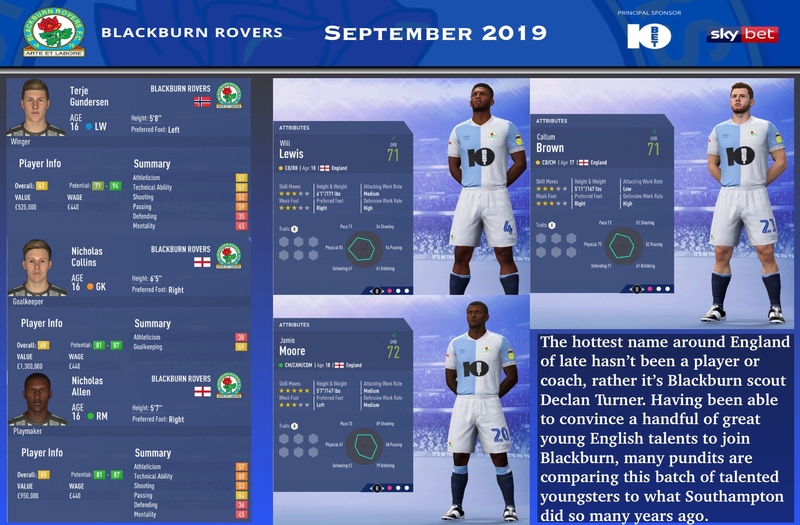 Brewster is a player I can’t wait to see develop. Think he’s going to be special. 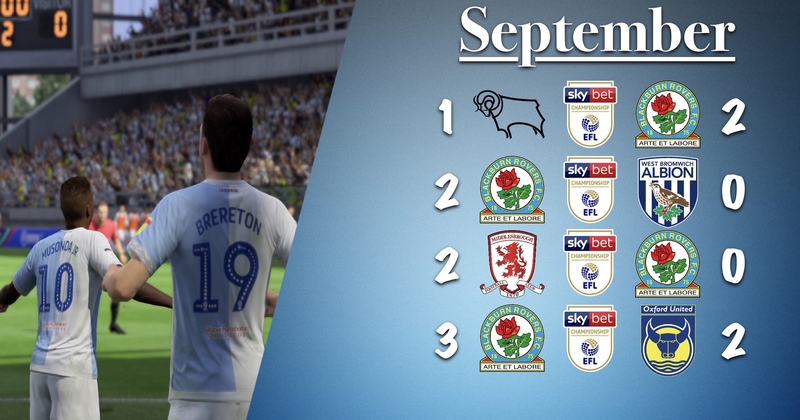 September saw Blackburn’s hot start to the year continue. 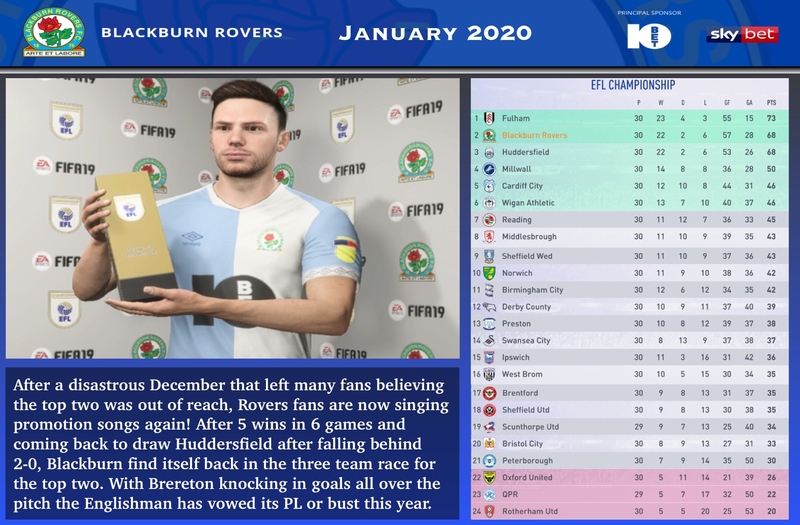 Even a tough loss to newly promoted Blackburn couldn’t deflate the feelings around the club as they sit second in the table after 10 games. On route to the Premier League I guess, but if so, you'll need a huge improvement. Your current squad is nice in the Championship, but falls short at the highest level. 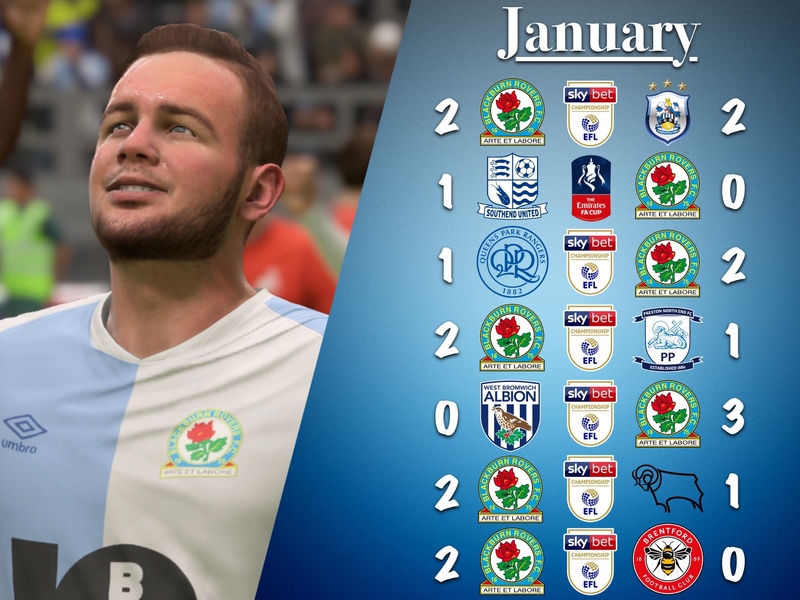 I agree with @Danimal5981 that you need improvement if you reach the PL, but for now Blackburn is not there yet. Impressive start but 36 games left so anything can happen, although you are on the right path. Very impressive start. It is early in the year but it is shaping up to be a 3 team race for the 2 automatic promotion spots. Yeah I’m almost afraid to take this team to the PL. We are young and talented but I don’t think we’re quite ready. Hopefully if we do go up we get a nice injection of funds. So this scout discovered them having OVR levels at (or clos to) 70 already? That's not bad at all! 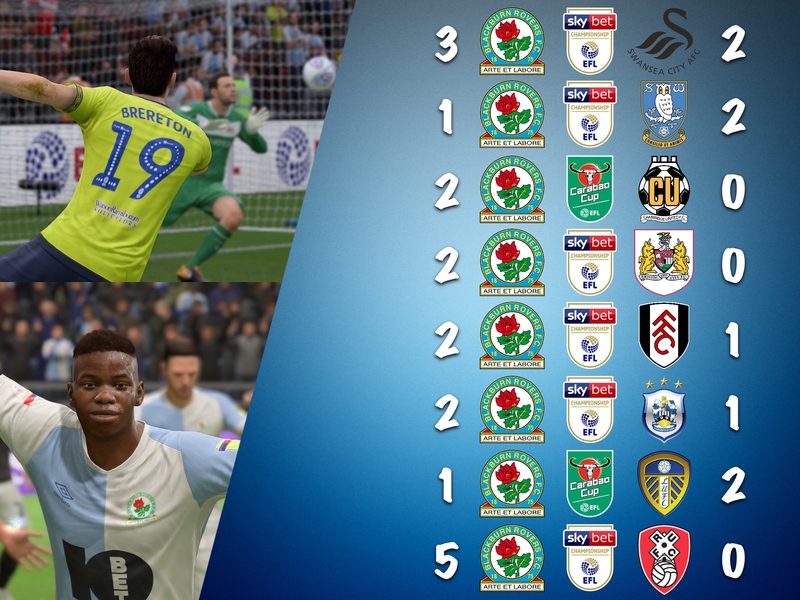 Good run of games and promotion seems a realistic option. As you say, even if the team isn't ready for the PL, there will be higher funds next Summer. The most important is to keep the good level of the team now. Yeah I’ve never had so many high potential players this early on. 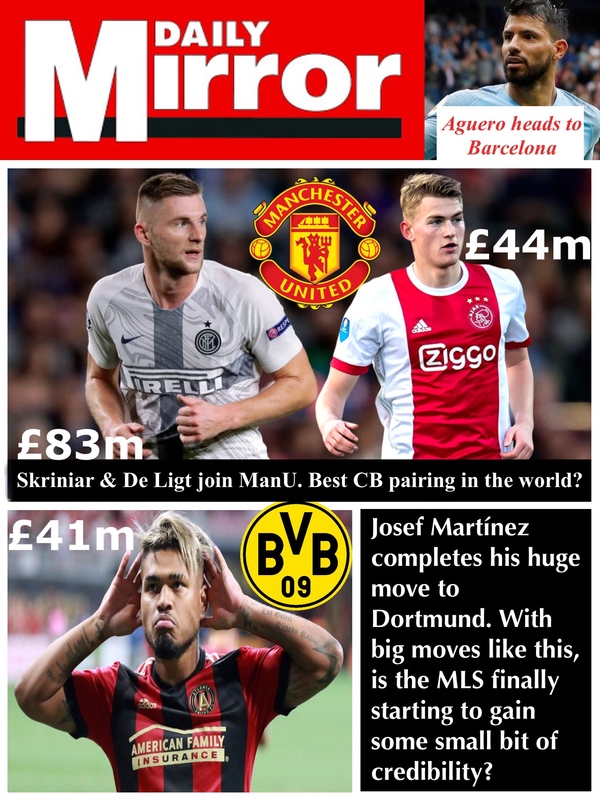 The two CBs especially will be huge going forward. 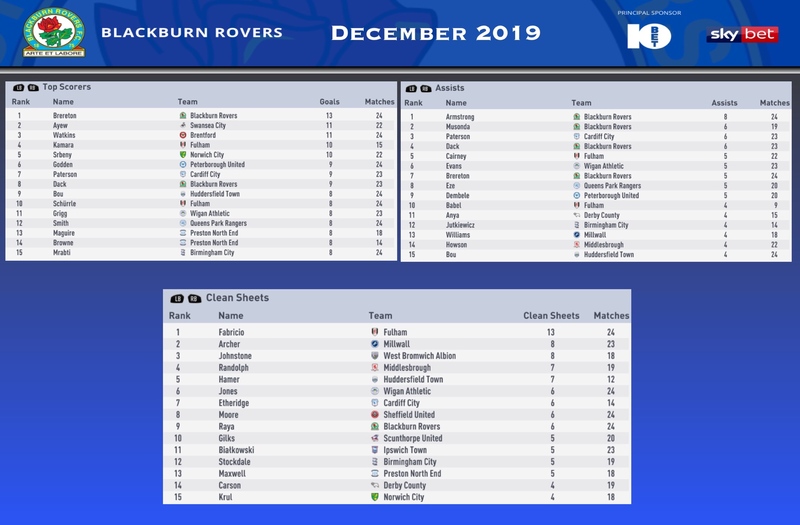 We skip ahead to the end of December and the race for the top two takes an interesting turn as Blackburn drops 3 games in the month to fall behind Fulham and Huddersfield. 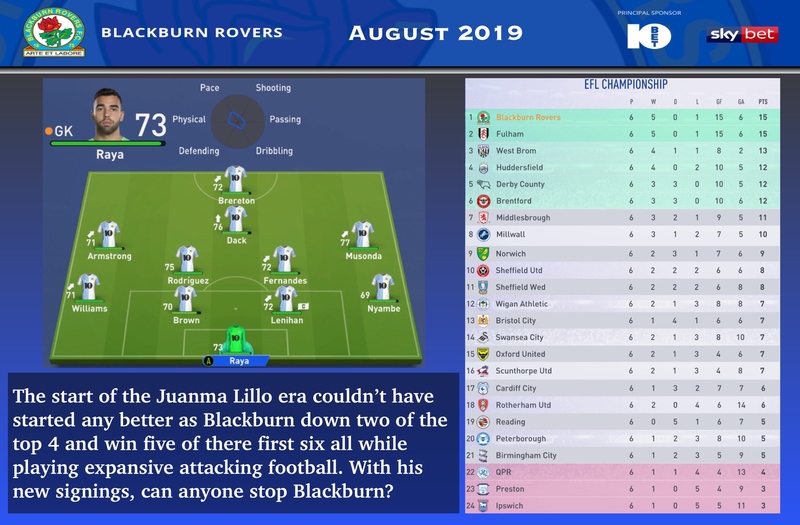 Blackburn fans are loving the hot start and feel comfortable in securing top 6 but it’s safe to say they would all prefer top 2. A big gap with Wigan but as you say the play-offs are unpredictable so only the first two spots do really count. Hope you find your good form back and catch up with Fulham and Huddersfield. 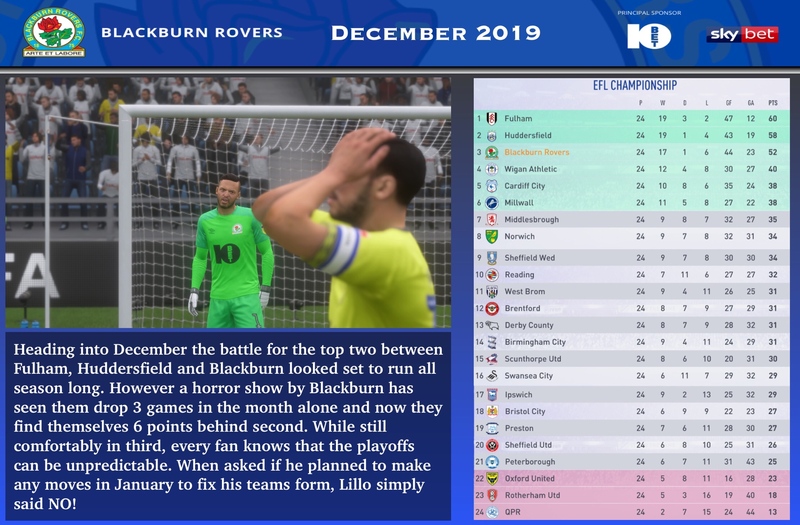 A December to forget was soon forgotten as an incredible run in January has somehow seen Blackburn climb back to second place as they now look to track down Fulham.